Good afternoon morons and moronettes, and welcome to the Saturday Afternoon Chess/Open Thread, the only AoSHQ thread with content specifically for all of us chess nerds who pay homage in the temple of Caïssa, goddess of pawn storms and queen sacs. And, for those of you who aren't nerdly enough for chess, you can use this thread to talk about checkers, or politics, or whatever you wish, only please try to keep it civil. Nobody wants to get into a pie fight on a Saturday afternoon. Except maybe for grammie winger, who suggested a couple of weeks ago that she wouldn't necessarily be averse to the idea. Maybe she could have one at her wedding. The answer to this problem is the final move of Kossak-Dufresne, Berlin, 1851, which you can look at in its entirety here. I urge you to do so. Kossak's furious attack after Dufresne's time-wasting 13...Bxa1 is fun to watch. There is a well-known tactic called "removing the defender" wherein a piece that's defending another piece or a critical square is either traded off or pushed out of the way ("deflecting the defender"). You can use that tactic to solve this problem. Those curious about chess and wishing to learn more about the game (but not too much more) will welcome this accessible, nontechnical introduction. Shenk (The Forgetting) succinctly surveys the game's history from its origins in fifth- or sixth-century Persia up to the present, touching along the way on such subjects as his own amateurish pursuit of the game, erratic geniuses like Paul Morphy and Bobby Fischer, chess in schools today, computer chess and his great-great-grandfather Samuel Rosenthal, who was an eminent player in late 19th-century Europe. 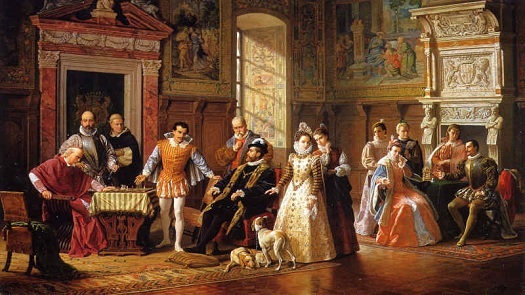 To heighten the drama, Shenk intersperses the text with the moves of the so-called "immortal game," a brilliant example of "romantic" chess played between Adolf Anderssen and Lionel Kieseritzky in London in 1851. Appendixes include transcripts of five other great games, along with Benjamin Franklin's brief essay "The Morals of Chess." Readers will come away from this entertaining book with a strong sense of why chess has remained so popular over the ages and why its study still has much to tell us about the workings of the human mind. Little bit tricky, because some of the moves aren't checks or forced responses to checks. 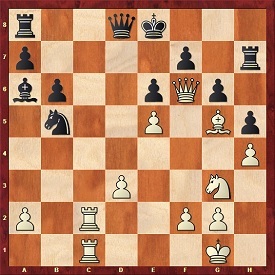 This type of endgame, where one player has a king and queen, and the other player only has a king plus one pawn, but the pawn is one move shy of queening, is one that is not uncommon in practical play. Perhaps you have seen it yourself in an endgame of your own. With some exceptions, White can generally win. If Black can succeed in queening the pawn, it's a draw. 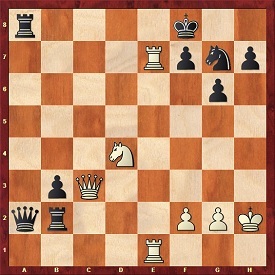 White, of course, needs to capture the pawn cleanly and not swap his queen for it. So he needs to bring his king up to help with the capture. 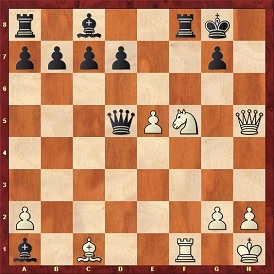 To do this, White will deliver a series of checks that will eventually force Black's king to take refuge on d1, blocking the advance of the pawn. 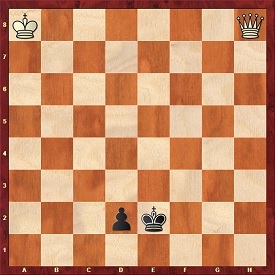 Then, and only then, will White be able to bring his king closer by a square. Then the process repeats. The purpose of this first move is to bring the queen closer to start the checks. Note that the pawn can't move, so the King must. So it took 6 moves for White to move his king one square. But that's OK, I was able to bring this game to a successful conclusion (mate) in 28 moves. There's probably there's a shorter line that I missed. But now that I've shown you the general technique, you all should be able to finish up. I kind of feel sorry for Dufresne. Not only was he on the losing end of a very famous game Aldof Anderssen played against him (which is known by chess historians as the "Evergreen" game, which you can look at here), but the majority of his games recorded in the chessgames.com database are losses. And most are to Anderssen. It looks like Dufresne had to fetch a lot of juice boxes for Anderssen. Notice that 1.Qe7 would be checkmate were not for the Black queen on d8. So all White needs to do is to stop that queen from protecting e7. Even if he has to sacrifice every piece he has, it would be worth it, because his victory would be assured. So, how can White do this? Again, this technique of removing a defender either by capturing it or forcing it to move to another square is an extremely useful tactic and you should be looking for opportunities to use it in your games. Just like before. And now the King is brought closer. I may have made a mistake here. I think I should've been able to force Kd1 earlier. Like instead of 18.Qe3, I should've played 18.Qc4+. Would've shaved off 2-3 moves. So there you are. Again, it may not have been the shortest solution, but hopefully you can see the technique I employed and maybe you'll get the opportunity to use it in your own games. Note: that cryptic line of letters and numbers you see underneath each board diagram is a representation of the position in what is known as "Forsyth-Edwards Notation", or F.E.N. It's actually readable by humans. Most computer applications nowadays can read FEN, so those of you who may want to study the position, you can copy the line of FEN and paste into your chess app and it should automatically recreate the position on its display board.